For several sieges of Edessa, see Siege of Edessa. A rock-face relief at Naqsh-e Rostam, depicting the triumph of Shapur I over the Roman Emperor Valerian. The Battle of Edessa took place between the armies of the Roman Empire under the command of Emperor Valerian and Sassanid forces under Shahanshah (King of the Kings) Shapur I in 260. The Roman army was defeated and captured in its entirety by the Persian forces; for the first time in Rome's military history their emperor was taken prisoner. As such, the battle is generally viewed as one of the worst disasters in Roman military history. Prior to the battle, Shapur I had penetrated several times deeply into Roman territory, conquering and plundering Antioch in Syria in 253 or 256. After defeating the usurper Aemilianus and assuming the purple for himself, Valerian arrived in the eastern provinces as soon as he could (254 or 255) and gradually restored order. Soon he had to confront a naval Gothic invasion in northern Asia Minor. The Goths ravaged Pontus and moved south into Cappadocia. An attempt from Valerian and his army in Antiocheia to intercept them failed because of the plague. While his army was in that weakened state, Shapur invaded northern Mesopotamia in 260, probably in early spring. In his sixties, the aged Valerian marched eastward to the Sassanid borders. According to Shapur I's inscription at the Ka'ba-ye Zartosht, Valerian met the main Persian army, under the command of Shapur I, between Carrhae and Edessa (in Middle Persian: Urhāy), with units from almost every part of the Roman Empire, together with Germanic allies, and was thoroughly defeated and captured with his entire army. According to Roman sources, which are not very clear, the Roman army was defeated and besieged by the Persian forces. Valerian subsequently tried to negotiate, but he was captured; it is possible that his army surrendered after that. The prisoners included, according to Shapur's claims, many other high-ranking officials, including a praetorian prefect, possibly Successianus. It has also been claimed that Shapur went back on his word by having the emperor seized after agreeing to truce negotiations. There are varying accounts as to Valerian's fate following his capture at the hands of Shapur. Some scholars claim Shapur sent Valerian and some of his army to the city of Bishapur, where they lived in relatively good conditions. Shapur used the remaining soldiers in engineering and development plans, as the Romans were skilled tradesmen and artisans. Band-e Kaisar (Caesar's dam) is one of the remnants of Roman engineering located near the ancient city of Susa. 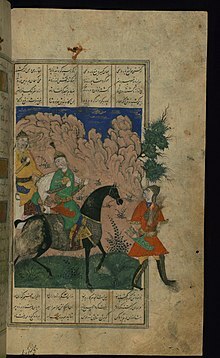 According to another source (Lactantius), Shapur humiliated Valerian, using the former emperor as a human stepping-stool while mounting his horse. He was reportedly kept in cage and was humiliated for the Persian Emperor's pleasure, according to Aurelius Victor. Upon his death, Valerian's body was allegedly skinned and stuffed with, depending on which account, manure or straw, to produce a trophy of Roman submission preserved in a Persian temple. However, there are also accounts that stipulate he was treated with respect, and that allegations of torture may have been fabricated by Christian historians of the Late Antiquity to show the perils that befell persecutors of Christianity. Following Valerian's capture, Shapur took the city of Caesarea and deported some 400,000 of its citizens to the southern provinces of the Sassanian Empire. He then raided Cilicia, but he was finally repulsed by a Roman force that was rallied by Macrianus, Callistus and Odenathus of Palmyra. Macrianus proclaimed his sons Macrianus and Quietus as Emperors while in the Balkans; Ingenuus and Regalianus revolted too, only to be defeated by an army sent by Gallienus, the son of the captured Emperor Valerian. ^ Rome and Persia in Late Antiquity: Neighbours and Rivals "We learn that during the decisive battle near Edessa, not only high Roman officials but also the emperor Valerian himself were captured by Shapur with his own hands ... The Sasanians celebrated this victory, which was one of their greatest successes over the Western opponent, as an unparalleled triumph"
^ Encyclopaedia Iranica, "And in the third campaign, we set upon Carrhae and Edessa, and as we were besieging Carrhae and Edessa, Valerian Caesar came against us, and with him was a force (later specified as totaling 70,000) from the province (hštr) of the Goths and Germans (most Roman provinces are named)." ^ Encyclopaedia Britannica "Losses: Roman, more than 60,000; Persian, minimal." ^ Slootjes, Daniëlle; Peachin, M. (2016). Rome and the Worlds beyond Its Frontiers. BRILL. ISBN 9789004326750. ^ Paul Chrystal, Roman Military Disasters: Dark Days & Lost Legions, (Pen & Sword, 2015), 198. Lactantius, De Mortibus Persecutorum, v.
"Valerian" on De Imperatoribus Romanis.